Watch FUNAKI on The Edge & Christian Show that Totally Reeks of Awesomeness on the WWE Network! 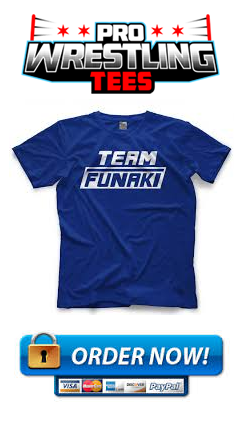 Check out the article at WWE.com that features FUNAKI and FUNAKI Dojo! We protect our Ring and our Students with Syndicate’s revolutionary Antimicrobial service!! Syndicate’s patented product ARMOR 90X is proven to greatly reduce or eliminate the buildup of staph, MRSA, ringworm, influenza. and other harmful microbes including viruses, bacteria, mold, and fungi. The best part is that, unlike traditional cleaners, it keeps on killing when it is dry!! ARMOR 90X’s Antiicrobial surface protectant is non-toxic and non-leaching, water based and EPA registered making it safe for all industries, surfaces and the environment! ARMOR 90X kills the microbes mechanically by piercing the cell walls with microscopic ‘swords’. This process provides a dependable continuous killing process that is proven not to create “superbugs”! Syndicate guarantees their service!! By providing monthly ATP medical swab testing (a standard in the medical industry) to ensure a microbe safe environment. Syndicate ensures our gym is a “Certified Germ Free Zone” *. None 1-4 Anytime there is a show, I'm there! Why You Should Train at Funaki Dojo! Watch FUNAKI's victory at the 2004 Armageddon PPV to become the WWE Cruiserweight Champion at WWE.com! FUNAKI Dojo now accepting new students for facility in San Antonio, Texas! FUNAKI Dojo is currently taking applications for professional wrestling training in San Antonio, Texas. To learn more, email funakidojo@gmail.com or 210.417.4204. You can also fill out our online application by clicking here!